West Point Transmission is a proposed 1000 MW underwater power cable designed to help bring new and untapped power from northern and western New York State to the Westchester County and New York City area. An essential element in New York’s energy future, West Point will upgrade the aging and congested transmission system in the Lower Hudson Valley and provide reliable access to a wide range of clean power sources that will be needed in the future to meet the State’s 50% renewables by 2030 Clean Energy Standard (CES), particularly in the absence of Indian Point. The proposed route for the West Point Transmission facility begins at the Leeds Substation in Athens, New York, only about two miles from the Hudson River. Using the latest technology, the cable will then be buried safely below the river bottom for a distance of approximately 80 miles, eventually making landfall in Cortlandt, New York. The cable will then tie into existing transmission facilities at the Buchanan North Substation, near Indian Point, allowing the continued transfer of power into New York City. The project will use efficient High Voltage Direct Current (HVDC) technology, taking advantage of the ability of HVDC to precisely control power flows. Converter stations will be built near the interconnection points at both ends of the line; these stations will convert Alternating Current (AC) power into DC power, and vice versa. West Point will be similar to the Neptune Regional Transmission System project, completed in 2007 by members of the West Point development team. 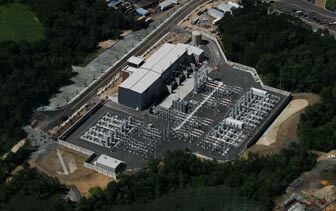 Neptune interconnects Long Island, New York, with the PJM regional power system in New Jersey. The Neptune cable was likewise buried underwater and underground, and featured two converter stations at either end of the 65-mile-long route.